Date: Wednesday, 9th February 1972. Scorers: Leeds United: Clarke (2). Liverpool: Nil. 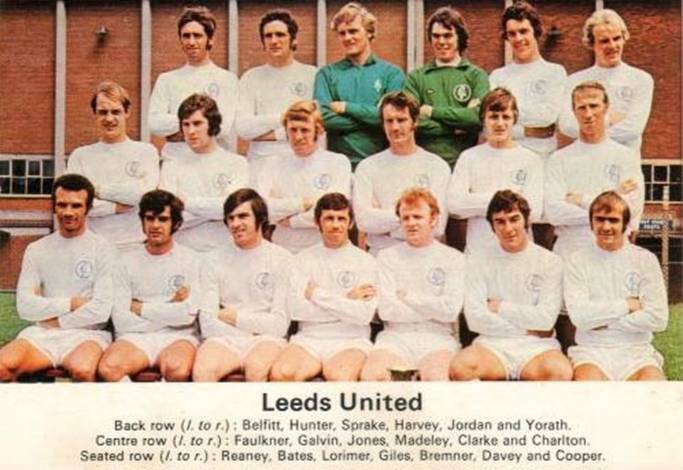 Leeds United: Sprake; Reaney (Jordan), Cooper; Bremner, Charlton, Hunter; Lorimer, Clarke, Madeley, Giles, E. Gray. 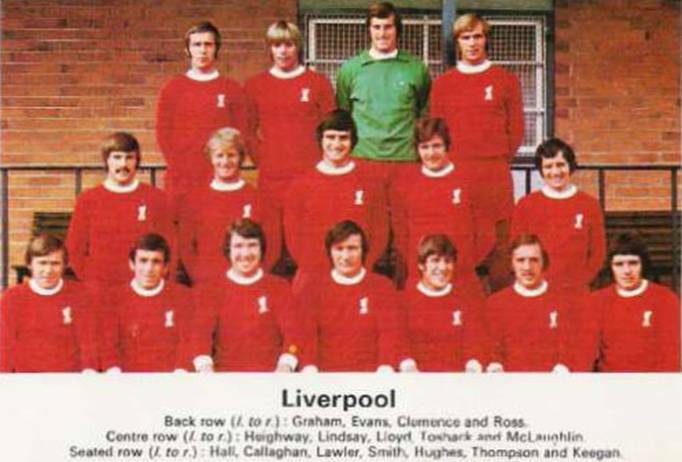 Liverpool: Clemence; Lawler, Lindsay; Smith, Lloyd, Hughes; Keegan, Ross, Heighway (Boersma), Graham, Callaghan. Referee: G. W. Hill (Leicester). Referee Gordon Hill stood aside to applaud both teams off the pitch after one of the greatest FA Cup ties fought out on the Elland Road turf. “The tie has produced the two greatest games of football I have ever been in charge of. The second goal will go down in soccer history,” said the distinguished official. 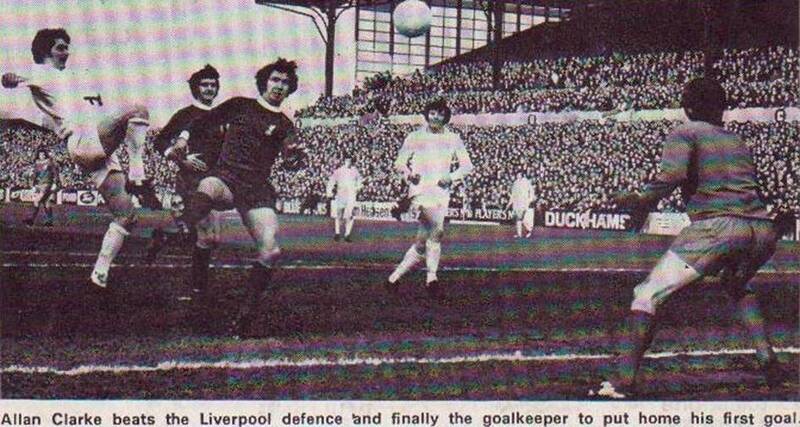 That second goal, scored by ace poacher Allan Clarke just after the hour, was a gem and finally killed off the Liverpool challenge. 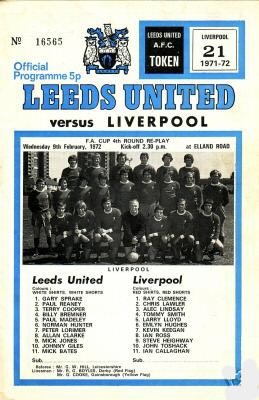 Leeds United have had few more satisfying victories than their 2-0 FA Cup Fourth Round replay success against Liverpool in February 1972. Having battled to a goalless draw in the first game at Anfield the previous Saturday, United were forced to play the replay on a weekday afternoon because of the power crisis caused by the miners’ strike. There was no guarantee that power would be available for the floodlights, but even though it was played on a midweek afternoon, the supporters turned out in their thousands to see the two top teams do battle again. Elland Road bulged to capacity, and hundreds more were locked out, and they were not to be disappointed with the fare served up, particularly United fans, who saw their side win the replay 2-0. As ever, Liverpool were full of drive and hard running but on this occasion they were let down by their lack of flair and finishing power. They produced some fine football , and on another day could have brought them victory, but with Johnny Giles in fine form, this was where United had the edge in this game. 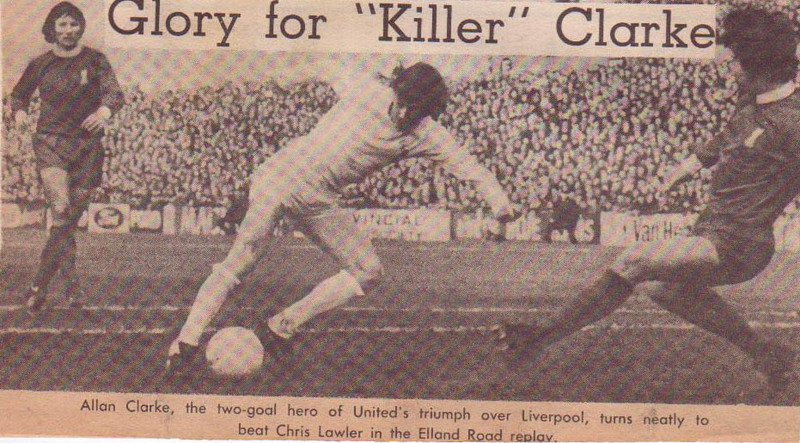 The untiring efforts of skipper Billy Bremner, who had to play up front in the absence of flu victim Mick Jones, and the heart-stopping coolness and composure of Allan Clarke were the other major factors in United’s win, which was crowned by two super strikes from Clarke. ‘Sniffer’ Clarke struck the first of his killer blows in the twenty-second minute after United had done most of the attacking. 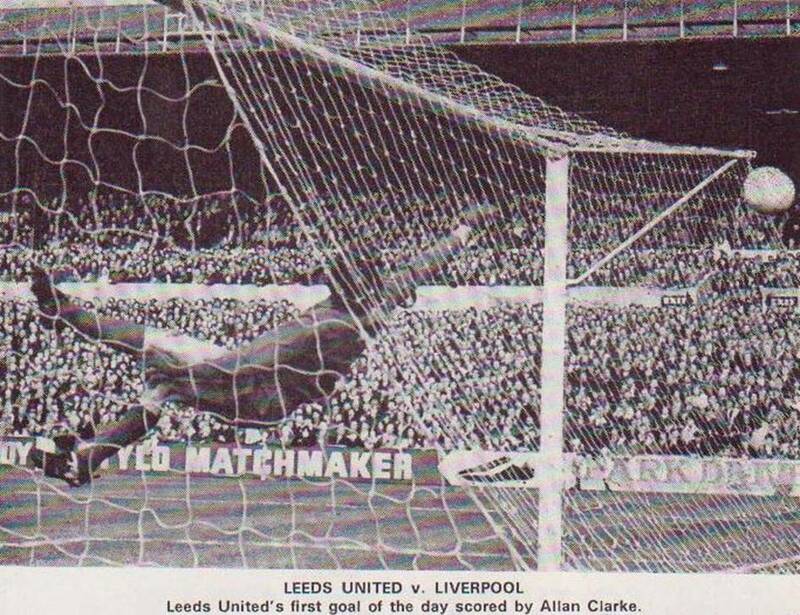 A skilful build-up led to Billy Bremner flicking a pass over the Liverpool defence and into the path of Clarke, who calmly and almost apologetically lobbed it over the advancing Ray Clemence. 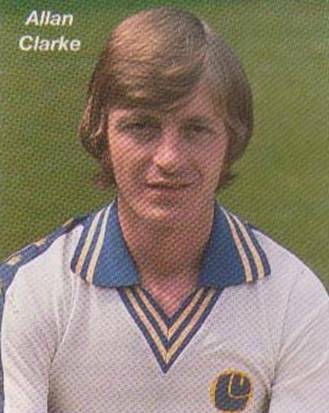 It was a fine goal but Clarke went on to greater acclaim with his second in the sixty-second minute. 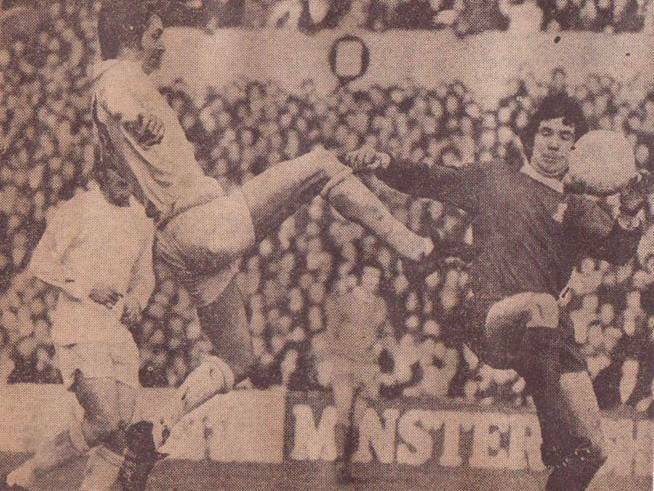 Norman Hunter, once again a towering figure in the United’s defence, began the move near his own penalty area with a great tackle on Steve Heighway. 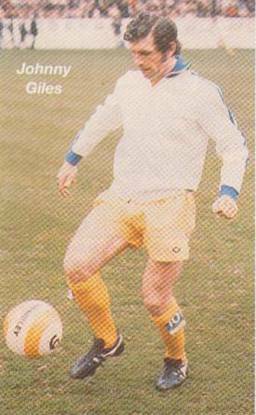 Johnny Giles drew Tommy Smith before sending Allan Clarke away on the left and he in turn left Larry Lloyd sprawling as he impishly pushed the ball between his legs before slipping the ball past Ray Clemence. It was a strike that bore all the hallmarks of a side playing with supreme confidence and United fully justified their tag of FA Cup favourites. United did not have it all their own way, particularly in the second half when they created a couple of chances but Substitute Phil Boersma and Chris Lawler could not provide the necessary finish. 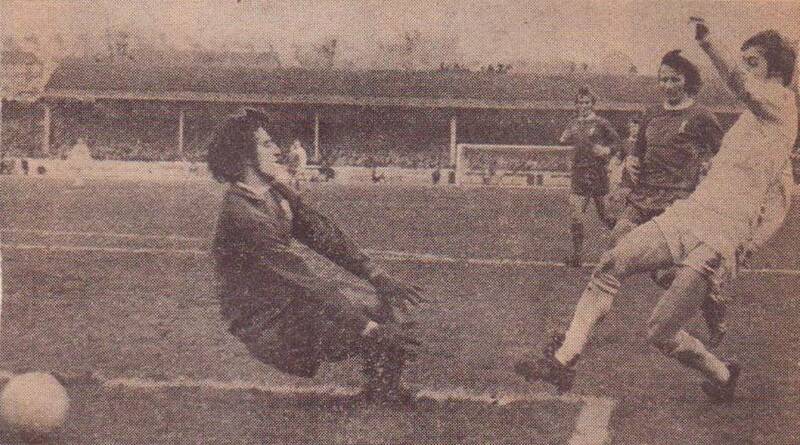 Gary Sprake handled the ball confidently, although a header from Larry Lloyd hit his post, but the Welsh international more than made up for that when he leapt across his goal in the second half to push out a header from Bobby Graham.